Duncan Welgemoed is one of the stars of South Australia's food scene, fusing a love of his South African homeland with a passion for the produce and lifestyle of his adopted home. 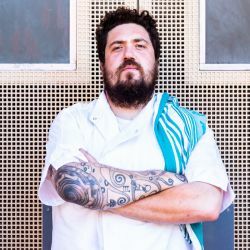 He has won multiple local, national and international awards for his restaurants Bistro Dom and now Africola, and has also been heavily involved with the success of events such as Lolas Pergola, The Riverbank Palais, Bario, Tasting Australia and the Beer and BBQ Festival. Born in Johannesburg, Duncan moved to London at 17, where he worked with the likes of Heston Blumenthal and Gordon Ramsay and developed his philosophy that excellent produce and simple techniques produce the best dishes. He met his restaurant manager wife Catherine Hazel - from Moonta on Yorke Peninsula - in Oxfordshire and they moved to Adelaide in 2010. Duncan works closely with local growers and producers, uses his restaurants as a platform to promote South Australia and its premium food and wine, and regularly brings leading interstate and international chefs to cook with him. "They leave wanting to move here," he said. "I've been spruiking the state from a food point of view since I arrived. "The produce is at the heart of everything."